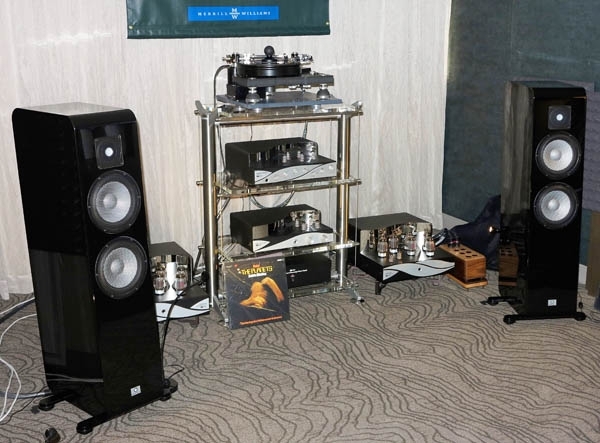 That my Saturday at RMAF began one flight up, on floor 6, would be of no significance save for one fact: the ascent revealed a handsome Zesto Audio/Marten/WyWires system that included the premiere showing of Zesto Audio's Andros Téssera tube phono stage ($12,000). This was one of those happy, expectation-fulfilling rooms where recordings actually sounded like music. I loved the timbres on a movement from Holst’s perpetually rotating The Planets, albeit highs were a little zingy at high volume. A Nat King Cole record featured gorgeous mids. There was a bit of booming in one narrow range on top, for reasons undoubtedly room-related, but the presentation was so musical and beautiful as to encourage me to ignore the minor problems. George and Carolyn Counnas told me that they found the room extremely dry, and had to remove a bunch of their usual absorption to achieve such beautiful sound. 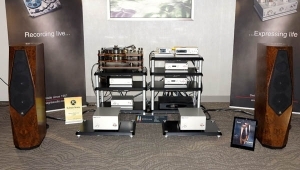 It helps that they had, in the chain and in addition to Zesto's Leto 1.5 tube preamp ($7500) and Eros 300 Class A monoblocks ($19,900/pair), a pair of Marten Django L loudspeakers ($9,000/pair), a Stillpoints ESS42-26-5 rack ($10,000), and a Merrill Williams Audio REAL 101.2 turntable ($7200) with two Tri-Planar U2 classic 10” tonearms ($7200/each), respectively outfitted with Benz Micro Gullwing SLR MC ($3600) and Ortofon Cadenza Mono MC ($1280) cartridges. WyWires Diamond and Platinum Series cabling held it all together, with a WyWires Daedalus Platinum Power Broker AC distributor ($2995) helping to transform current into music. Visiting this room brightened my day. Dave Fisher’s start-up, db Sound, which sells direct via the web, greeted me with the Beatles in stereo. We're talking about playing the Beatles for someone who believed, in the pivotal summer of 1967, that the world was made of tangerine trees and marmalade skies. The sound was kinda bright, although free of the distortion that had a field day through the crappy littlespeakers of the portable phonograph we listened to that summer long, long ago. Then again, when I was stoned out of my tree listening to the Beatles, all the distortion in the world couldn’t sully my experience. Was this a classic case of flying higher than the High End? Gear shift. Back to the present. A recording of Ashkenazy playing Beethoven’s Piano Concerto 5 under Solti sounded quite lovely. The piano had a nice ring in the treble rangeI could hear the micro-tonalitiesand there was lots of color. 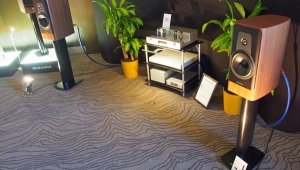 Doing the honors was db Sound’s high-efficiency DB3 radiating flat cone coaxial speaker ($2000/pair), whose design is claimed to increase off-axis response, and whose 16mm compression driver with stepped horn is coaxially mounted to the 168mm driver. 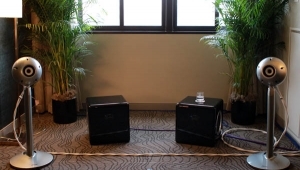 The speaker’s range is 168Hz32kHz, and it’s claimed sensitivity 99dB. Also heard: Empire 598 turntable with Ortofon XS cartridge, handmade tube phono amp, and LM 875 power amp. 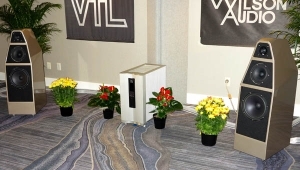 Another first-time exhibitor and web seller, Atrevit Acoustic of Fort Lauderdale introduced its new fully active, three-way Reference 1 loudspeaker (approx. $25,000/pair). With a brewery/conga aesthetic likely to get a rise from the spouse/partner acceptance factor (S/PAF) in all of us, the Reference 1 uses Altec-based drivers, and claims a frequency response of 27Hz20kHz. 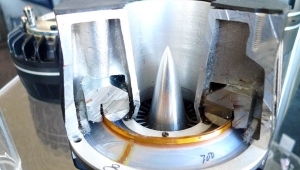 “I call it a loaded open baffled design because there is some pressure on woofer drivers,” either Jose Melendez or Greg Hatch of Atrevit said of a design that uses pure silver point-to-point wiring. Atrevit used a La Scala DAC MKIII driven off a laptop to play me a bit of "Hall of the Mountain King" from Grieg’s Peer Gynt Suite via iTunes. There wasn’t much warmth in the presentation, nor much grace in the tweeter range. 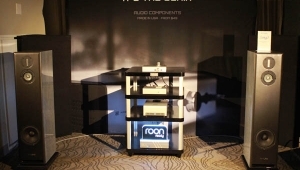 As one of the few headphone amplifier companies to exhibit both in CanJam and the Tower, Woo Audio seemed intent on reinforcing their audiophile credentials. Not that they had to struggle to do so. 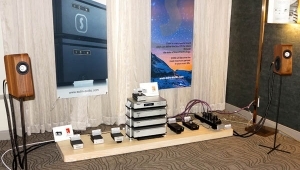 Listening to a bit of a DSD file of the second version of Gilbert Kaplan’s take on Mahler’s Symphony 2, the single-ended class-A Woo Audio WA-234 Mono ($16,000/pair)which is claimed to be “the world’s first mono-block headphone and speaker amplifier”took advantage of a Mytek Brooklyn DAC ($1995, and reviewed by Jim Austin in the November issue of Stereophile) and Abyss AB-1266 headphones ($5500) to produce exceptionally smooth albeit slightly dry sound. Given the noise in the room, concentrated listening was a challenge, but what I could hear sounded quite lovely and seductive. In the photo, company president Jack Woo is shown next to the WA234 Mono’s plug-in keys. 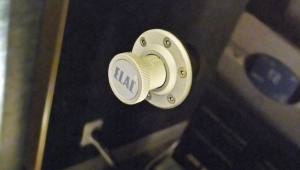 Woo makes tube-rolling easy, with different keys for different tubes, and other keys for adjusting the amp’s output and headphone impedance-matching. 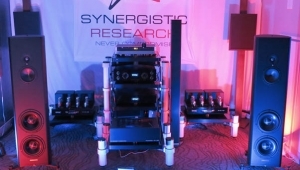 Esoteric’s brand new F-05 integrated amplifier ($10,000) had but 30 hours of break-in when I arrived at the company’s room. And it should be noted that the Canton Reference 3K speakers ($15,600/pair) in use were an unfamiliar entity to Esoteric’s Scott Sefton. Since they include midrange and tweeter adjustments on the backs of their cabinets, perhaps a notch up on the tweeter was responsible for the bright edge I heard at the top of baritone Hermann Prey’s voice as he sang, at fairly low volume, “Largo al factotum” from an Esoteric SACD transfer of a recording of Rossini’s Il barbiere di Siviglia. 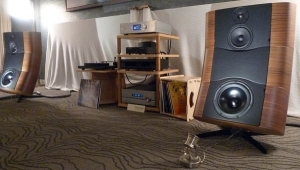 The midrange, however, was simply gorgeous, and, happily, far more prominent than in previous experiences listening to Esoteric gear through Cabasse loudspeakers. Soundstage depth was also notable and compelling on a Jack Vad-engineered SACD of a San Francisco Symphony recording of Mason Bates compositions. 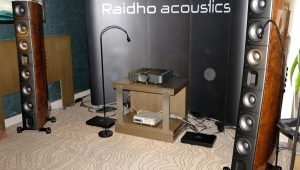 Also in use were the Esoteric K-05X SACD player ($8000) and recently released N-05 network audio player ($6500), the latter emitting a little buzz on top. I’ve got to hand it to the folks at Evoke Speakers for naming what they had dubbed their “prodigy in the making” Eddie. I’ve also got to offer the Chutzpah Award of the Day to a company whose only means of contact seems to be a website form to which they promise to reply within two business days. Eddie lists for $3495/pair, and has a “true flat ribbon” tweeter, a "Strat F1 planar" midrange, and 7” RM7 woofer. Frequency response is 32Hz30kHz, ±3dB, and sensitivity is claimed as 89dB. 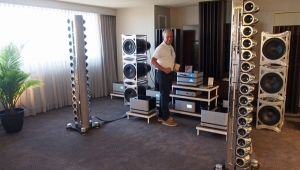 Our friend Eddie was paired with Wolf Audio Systems’ Alpha 2 Red Wolf server ($8000) and Echo 8 CD station ripper/server ($3600), a borrowed Ayre Codex (after the intended Veracity Audio Chrysalis DAC£5690 pounds base pricewas lost in transit), Linear Tube Audio’s MZ2-S ($1845) and upgraded ZOTL40 ($5800) headphone amps/preamps, Audience cabling and power conditioning, and a Box Furniture rack. You're the second person to mention this. I am seeing double at 2:15 AM, it is true, but I am also 100% convinced that the show lasted from Friday, October 7 through Sunday, October 9. If our writing sounds as though we are reporting in the present moment, please chalk that up to sound so vivid that we cannot help but relive the experience. That's what you get for being a nitpicker. Please forgive me. But you're right: At least for us on the other side of the dam, with limited contact with the US show schedules, this felt like semi-superhuman live coverage. Worth noting, I guess, as it says something about reader expectations to and conventions in the blog format. is from Aqua Hifi and not from dCS. You say that Esoteric rep was unfamiliar with Cantons. 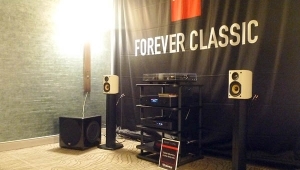 Who decides what electronics are paired with what speakers at shows like this? 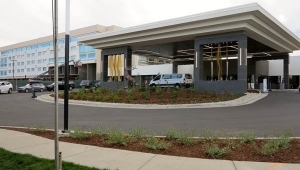 I'm sure that if it's a dealer's room, they're pairing stuff they sell, but wonder how it works for manufacturers' rooms. In every case - I do not know the particulars here - pairings are made. 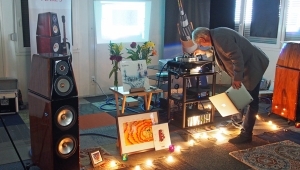 Sometimes they are between familiar entities, as in the case of the frequent combination of Wilson with VTL or D'Agostino, dCS, and Nordost or Transparent. But in more cases that you may imagine, they are not. Years back, I remember one Canadian distributor of products only sold at list price who was furious that the independent speaker company he had paired with when others were already grabbed - it does feel a bit like searching for someone to dance with at the high school prom, and discovering all your top choices taken - was undercutting his rapidly diminishing dealer network and selling on Audiogon at deep discount. But he was stuck. I got no sense that Esoteric felt stuck with Canton. It was simply a case of not being familiar with the ins and outs of the loudspeakers and the best way to get them to sing. Every speaker does have its own particular radiation pattern, after all. Could Stereophile do a nice compilation of Wes Phillips best writing? I'm dropping this comment here as for some reason I wasn't able to comment in the article on JA talking about Wes at the memorial. I've had the same problem. Restarting your browser or computer sometimes helps. You might try doing so, because placing this comment in the appropriate place will draw more attention to it. 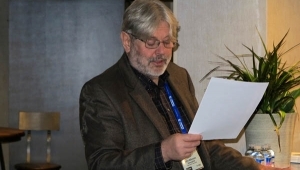 Having said that, virtually all if not all of Wes' writing for Stereophile can now be accessed on the website by conducting a search under his name. It is only fair to the makers of the Eddie that I clarify to say that the "Evoke Boys" were in fact representing other components in the room, and that no one from Evoke could make it to the show. Given the Eddie's non-traditional driver design, it's likely they didn't dial in the ideal placement. Had the real Evoke Boys been with us–knowing what the speakers sound like outside of that room–I'm sure Jonas could have belted into truly operatic decibels. But, hey, next time. Thanks for spending some time in our room. how to hack facebook account is problem to some people.